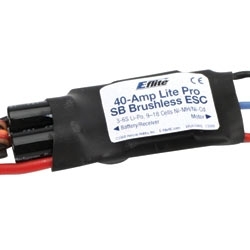 For up to 40 amps of continuous current with proper airflow, the E-flite 40-Amp Lite Pro SB brushless ESC delivers. It drives up to 7 analog or 6 digital servos with the BEC on any recommended input voltage. This brushless ESC includes programmable motor braking, soft start for helis and planes, timing, throttle input range and low voltage cutoff. It also features auto motor shutdown in case of lost signal or interference. The safe power-arm mode prevents accidental starts. All the great features of E-flite's popular 40-Amp Pro SB Brushless ESC, in a lighter weight package perfect for use in large-size park flyers and mid-size models where space and weight are more critical. Drives up to 7 analog or 6 digital standard-sized servos with the BEC on any recommended input voltage. This also includes up to 7 standard analog or 5 standard digital and 1 retract servo, perfect for 25-sized warbird conversions. be sure to position the ESC for maximum airflow since cooling can significantly aid in the performance of the BEC.